Solar Light’s Model 540 is a light weight, portable 5 channel Sunphotometer for measuring aerosol optical thickness, direct solar irradiance, and water vapor column easily, accurately and dependably. This multispectral instrument is designed to measure direct solar irradiance in five channels of selected wavelengths and to provide atmospheric properties, such as aerosol optical thickness and precipitable water vapor column. The unit features agrees comparably with much larger and more expensive instruments, packaged in a very small, handheld chassis. 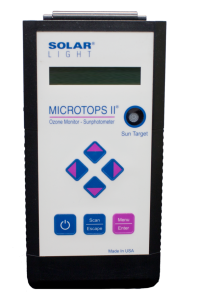 The Microtops II® 540 has been the gold standard in the professional atmospheric research community for years. It is heavily relied upon by the world’s leading weather stations for scientific studies, pollution and environmental monitoring, photobiology research, and much more!